"If you are watching your waistline and your calorie intake, these eggplant fries are a great alternative. Grease free and oil free, but just as tasty." Slice eggplant into 1/2-inch rounds, then cut each round into 1/4-inch sticks. Pat dry. Combine bread crumbs, Parmesan cheese, Italian seasoning, salt, basil, garlic powder, onion powder, and black pepper in a shallow bowl. Pour flour into a second shallow bowl. Beat eggs in a third bowl. 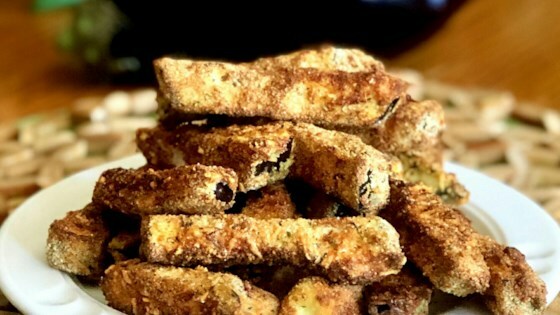 Dip eggplant sticks in flour, then in beaten eggs, and then coat with bread crumb mixture. Place on a plate and let rest for 5 minutes. Preheat an air fryer to 370 degrees F (185 degrees C). Place eggplant sticks in basket, making sure they are not touching; cook in batches if necessary. Cook in the preheated air fryer for 8 to 10 minutes. Shake basket and continue cooking to desired crispiness, an additional 4 to 6 minutes.